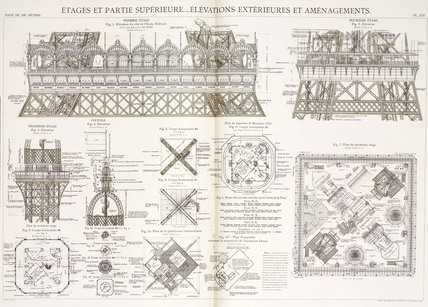 Diagram of the Eiffel Tower, Paris, c 1887. Architectural drawing showing the names of the scientists and other learned people on the exterior of the tower, Gustave Eiffel's office, and the cupola. Eiffel (1832-1923) designed the world-famous tower, built for the International Exhibition of Paris in 1889, commemorating the centenary of the French Revolution. The tower consists of four curved iron piers connected by a lattice of girders. Construction started in January 1887 and was complete on 31 March 1889. It was further enlarged for the 1937 exhibition. Illustration from Eiffel's book on the construction of the Eiffel Tower, 'La Tour de Trois Cents Metres' ('The Tower of Three Hundred Metres'), published in Paris in 1900.